Poul Haakan Stoustrup wanted a 1939 Lincoln Convertible so bad, that he had a 4-door sedan rebuilt into a convertible by a Danish Coachbuilder. When Palle Johansen from Denmark was a 12 year young kid, he spend his evening and weekends working at a local paint shop. Because he loved cars, loved to work on them, and of course to have some extra money in his pocket. 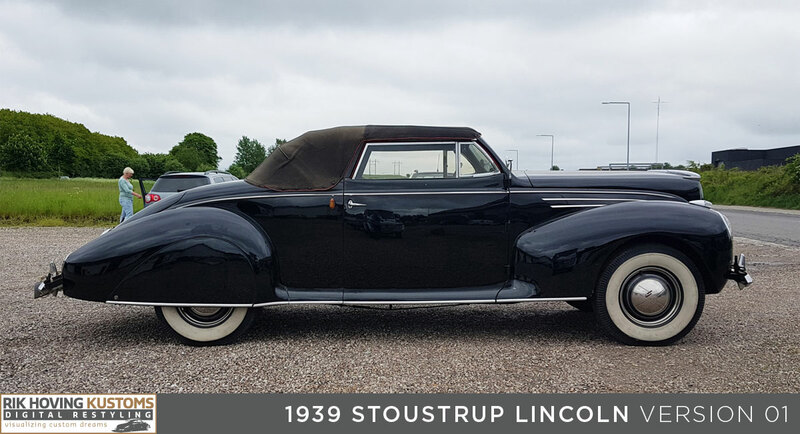 It was 1978 when a local brick factory owner brought in a ’39 Lincoln convertible for a new paint job. The owner of the car had started a car museum earlier in the ’70’s and had bought the Lincoln from the original owner’s family in ’72. Palle fell deeply in love with this amazing automobile. 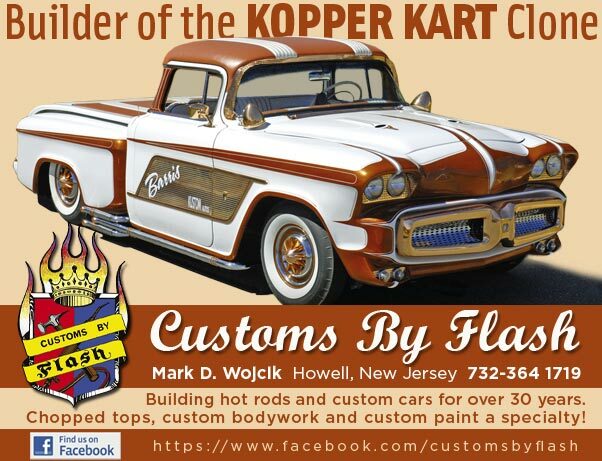 He remembers sanding the wonderful curved body shaped and fenders, and day-dreamed about owning this car one day. The car was painted and the new super glossy paint-job made the car look even better. 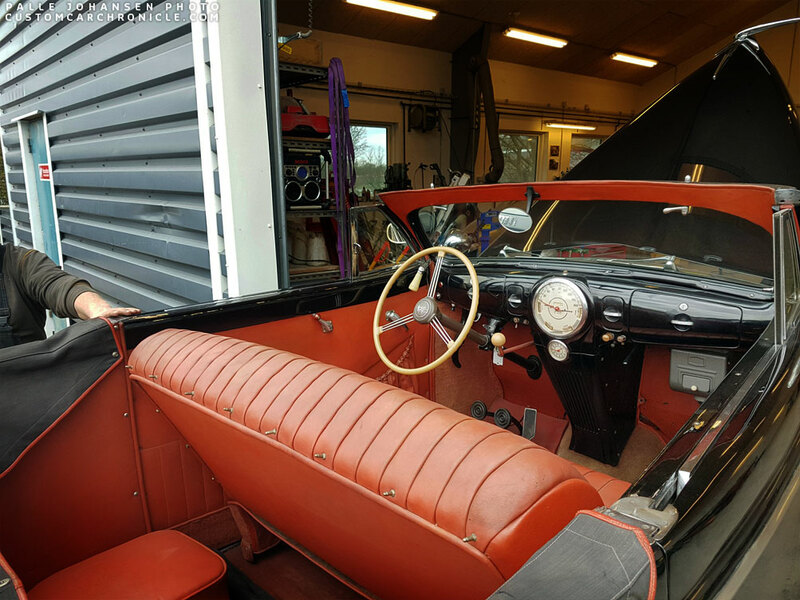 Years later Palle remembered the car from his childhood and was wondering what ever happened to it and got back in touch with the owner Thorvald..and his son Jorgen. He then found out that the car was not an original convertible but built from and coupe and converted to a convertible by a local body shop. The body shop also had chopped the windshield a bit, created new vent windows and a two piece removable soft top. 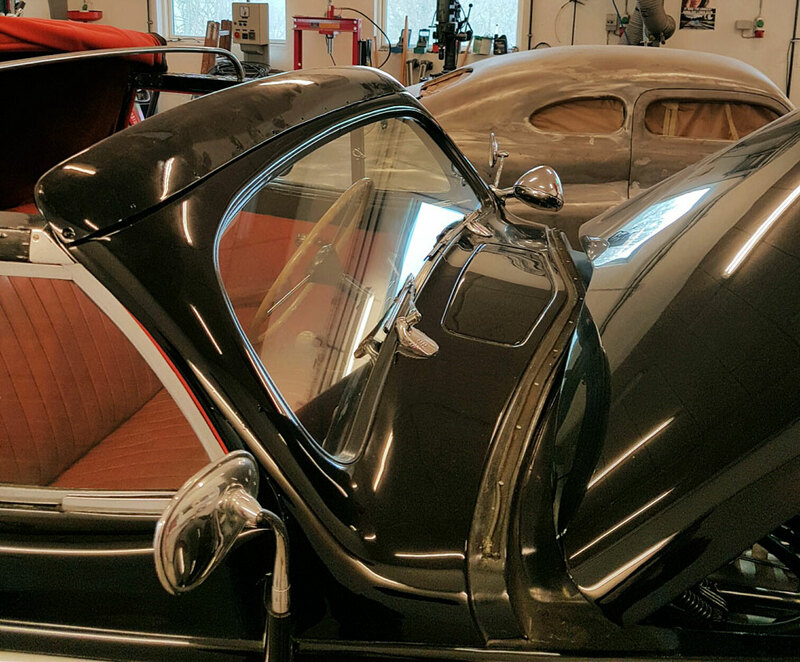 The owner told Palle that the car was in fact one of the very first Custom Car being built in Denmark, but there were no details available back then. Over the years Palle has always kept in contact with the owner, and the owner knew Palle really wanted to own this car one day. In March 2016 the owner gives Palle a call to let him know he is ready to let go of the Lincoln. 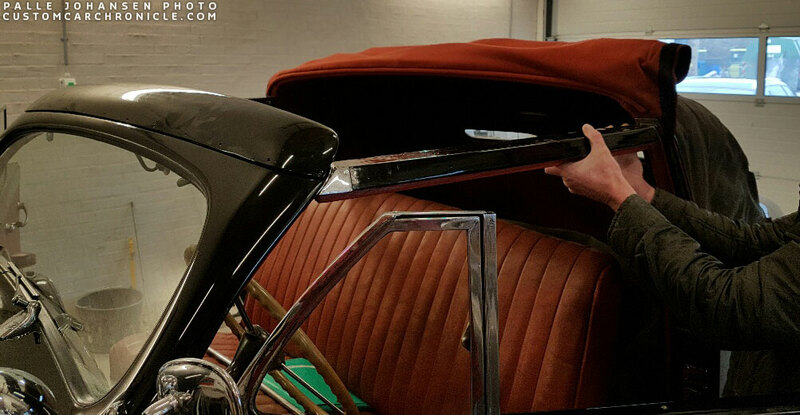 On April 24, 2016 the deal is made and Palle can pick up his new original Danish Custom Lincoln Convertible. As soon as he has the car in his garage he starts to look into the history of the car and finds out that the car never started life as a coupe as he always thought, but that it was in fact created out of a 4-door Sedan. 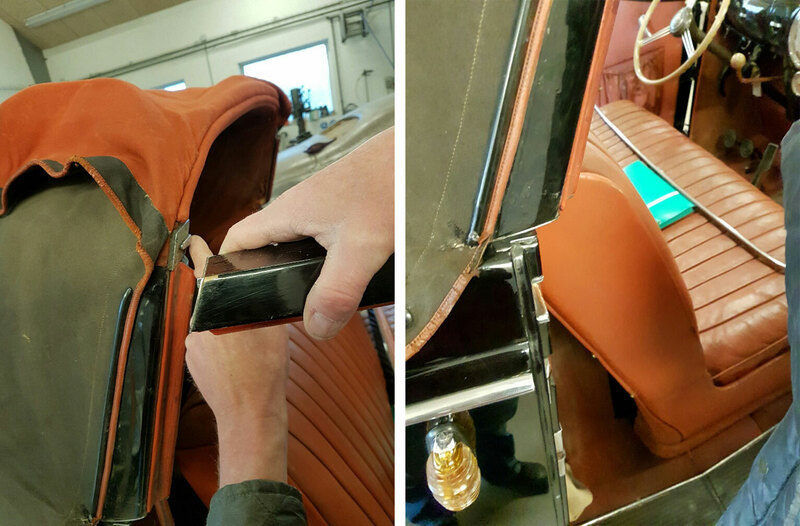 The really well done work was done by the Dansk Karosseri Fabrik, a Danish body shop in Copenhagen. 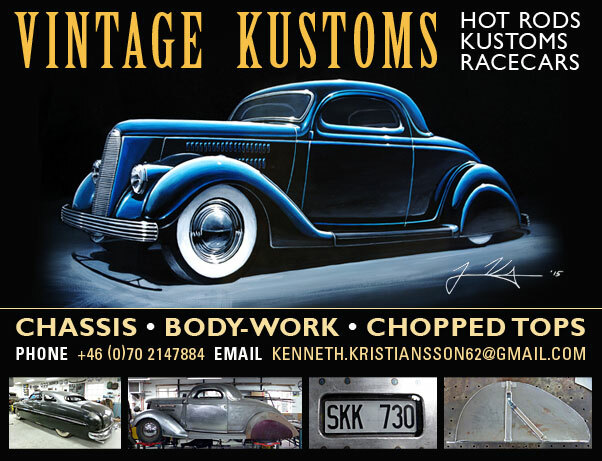 It all started with a ’39 Lincoln Zephyr 4-door sedan which was taken to the Dansk Karosseri Fabrik. So far this is the only old photo of the car Palle has been able to find. Most likely taken in the early 1950’s Very much faded, but if you look hard you can see that the front portion of the top is rolled up and attached to the back portion of the top. This is how the car was mostly diven. The History as we know it so far. The original owner of the Lincoln Poul Haakan Stoustrup, wanted a ’39 Lincoln Convertible really bad, but only 640 of those were built. Poul Lived in Denmark and WWII had just started, so there was no way Poul could get his hands on an original converible. 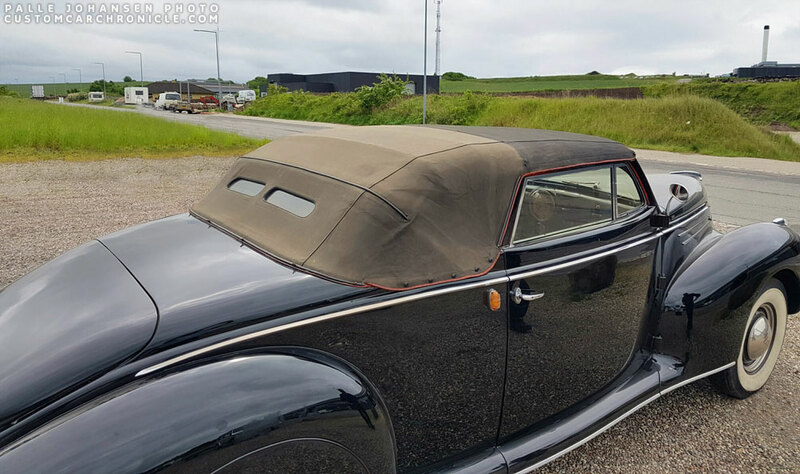 Instead he was able to get a 4-door sedan which he took to the Dansk Karosseri Fabrik with the question if they could turn it in a two door convertible with two part soft top. They sure could, and work on the car started right away. In the process of turning the 4-door sedan into a two door convertible the windshield was chopped a little to make it look more in proportion with the rest of the car. The shop much have had a lot of work on the body reshaping the trunk section and doors. 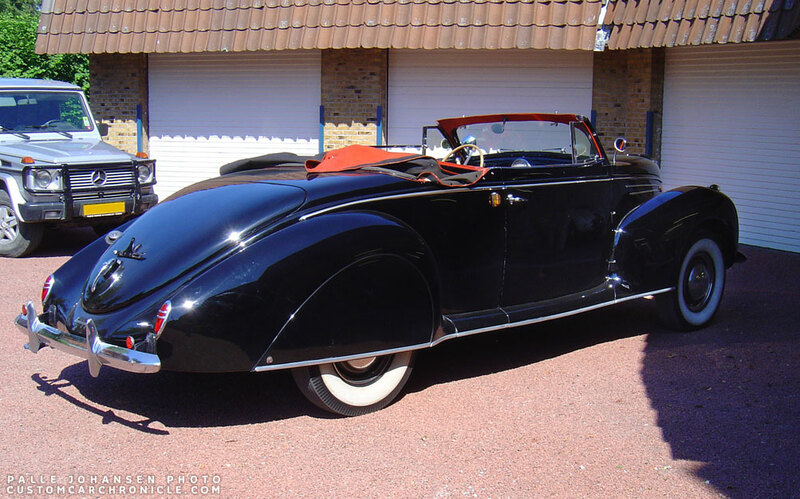 Since the car was build during the early stages of WWII it is assumed that no other body parts, as in longer doors and trunk were used on the car. Everything was hand shaped. The shop also created a two part soft top to fit the lower windshield around 1,5 inches. 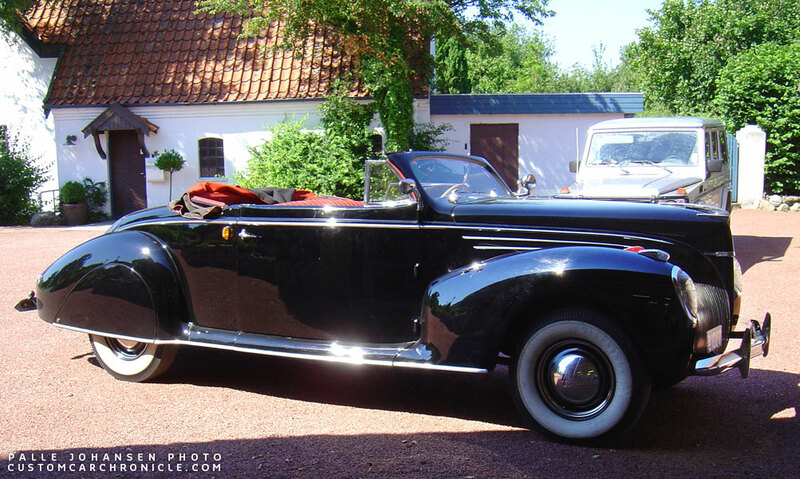 The car was finished in early 1940, but as far as Palle has found out the car was not on the road until after the war in 1946. 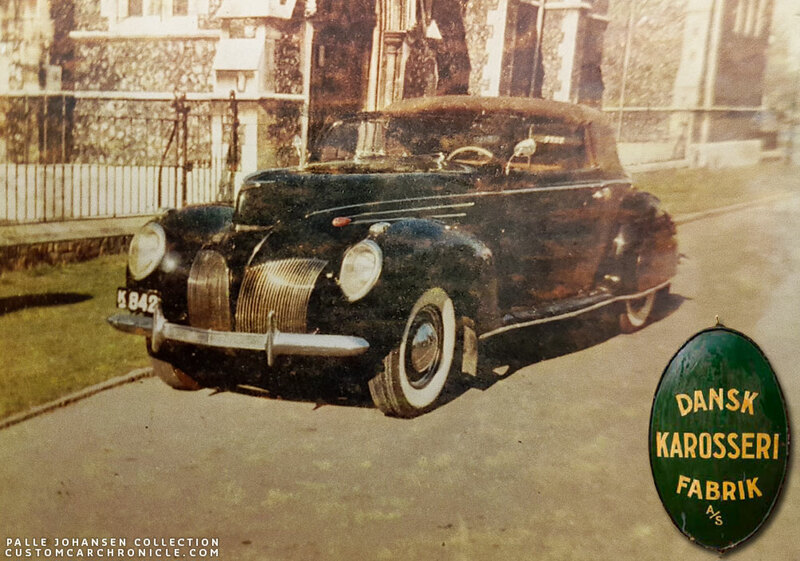 The first Danisco Customs stamp on the paperwork shows that the car was built from a 4-door, and coachbuilt into a two door convertible and registered as such in April 1946. 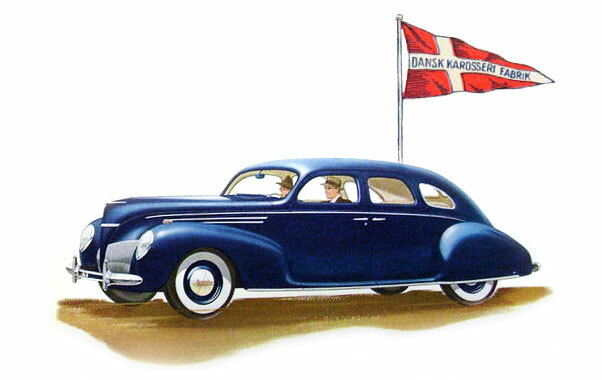 The Dasnk Karosseri Fabrik in Copenhagen Denmark created this very first custom car in Denmark in late 1939′ early 1940. The nice etched brass tag is still mounted on the fire wall. A couple of years ago Palle was able to take a good look at the car again when the owner came over during a nice summer drive. 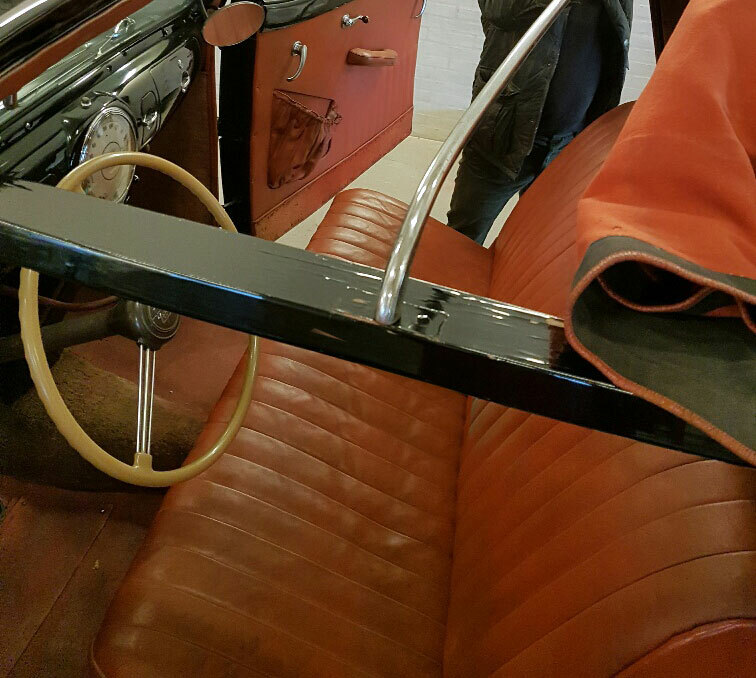 Several years ago, when Thorvald owned the car and had it displayed in his car museum a guy came to see the cars in the museum. He was shocked to find the Lincoln to be part of the collection. 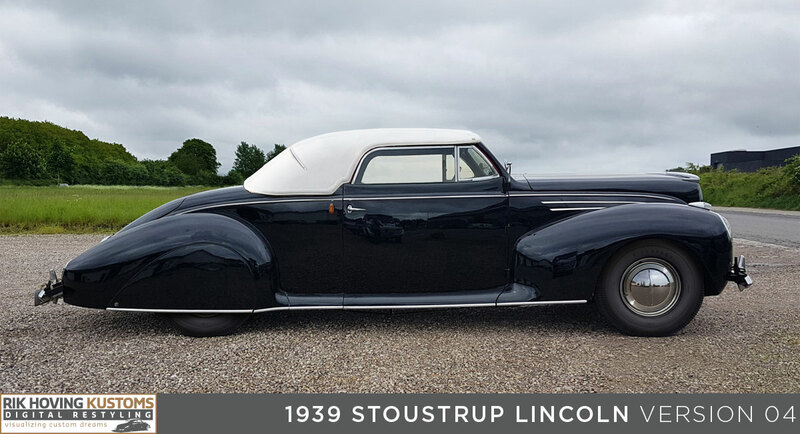 He told the owner of the museum that he used to be the private chauffeur for Poul Haakan Stoustrup and he used to drive around in the Lincoln. The guy told Thorvald how the owner always liked to drive with the front portion of the top down. And that is it was a rainy day he should just call in a cab to drive him to work. He did not like the front portion of the top to be in place. When Thorvald bought the car in ’72, it had 77.000 km on the meter (around 47.840 miles) Since then the car has not driven more than 5,000 km (around 3,100 miles). Palle has checked out the car really well and the workmanship on the car is really stunning. The way all the body work was done is just incredible with some very subtile restyling on the door tops, windshield and vent windows to make it different from a factory convertible. The work that was done on the top, with the separate front section and how everything locks into place is really amazing as well. 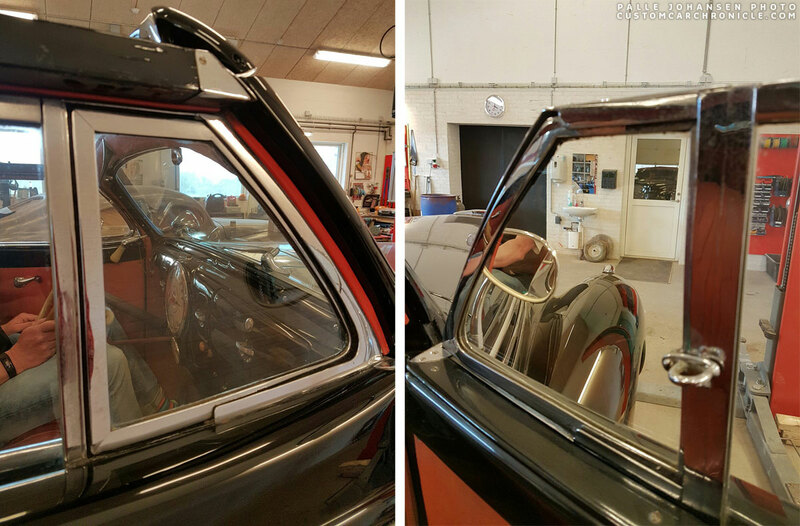 The two part top on the car as it was originally designed and made in late 1939. The color difference shows that the car drove around with the front section rolled up most of the time. The two part rear window is a really nice detail. A look inside the rear portion of the top. This is how the Lincoln sits now. Palle has already lowered the rear a little to give it a slightly better stance. But the proportions are still off and the car needs to come down a few inches more to look just right. The windshield was chopped about and inch and a half and a new header was created to support the new soft top. The vent windows wer completely hand crafted and the work and design on them is incredible. To suport the front section of the top there is an extra shaped metal bow that slips into a slot on the bar that goes from the windshield to the B-Pillar. 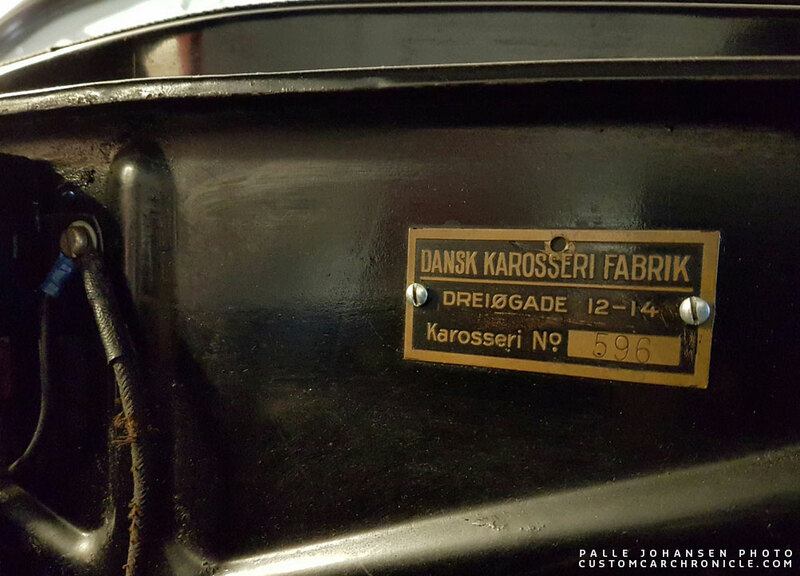 The front header and side bars for the top are all hand made by the Dansk Karosseri Fabrik. 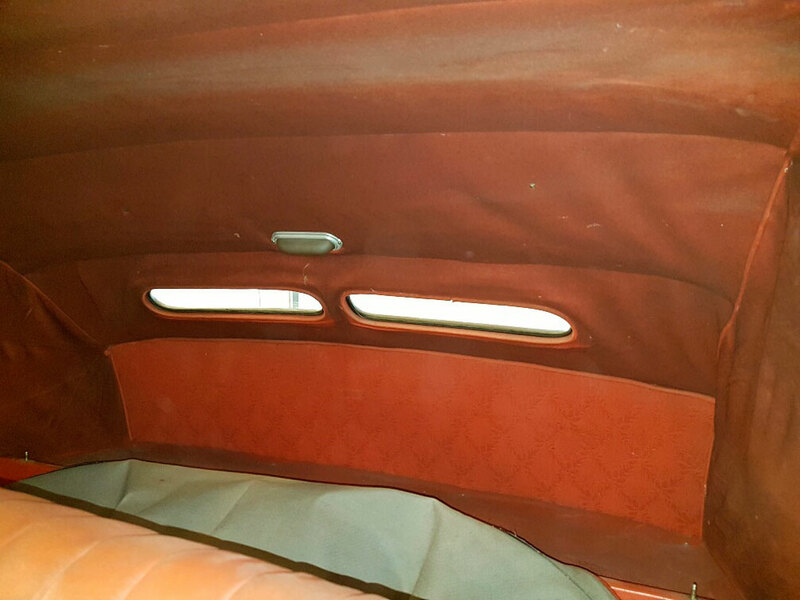 Notice the nice curve on the vent window, this gives away the car started out as a sedan body. With the top bow removed this bar can now be removed. To make the top a two part unit, the front section used a bar on each side of the car running from the front header to the specially made B-pillar. A well crafted mechanism was designed and made that still works flawless today. The bar connects to the Special made, and removable B-Pillar. Interior is done in red leather. 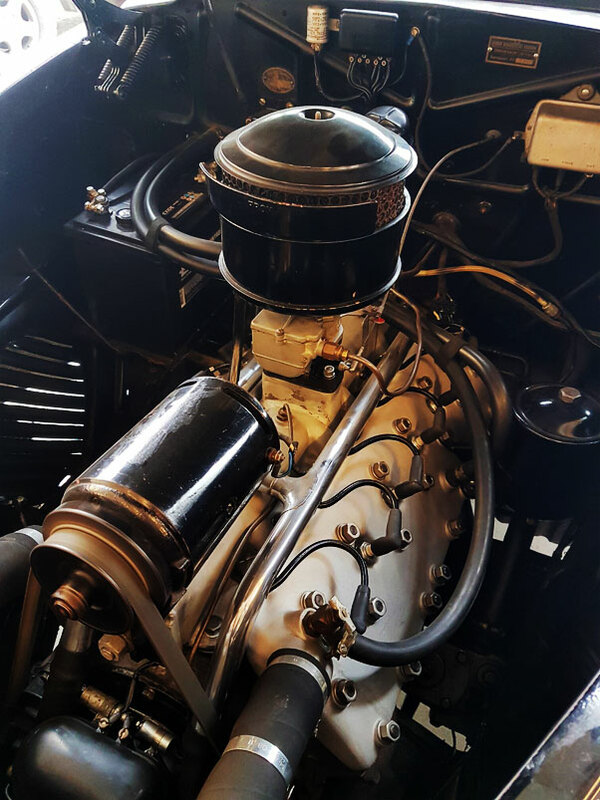 The completely restored V-12 engine looks and runs amazing. The car still has the paint on it that Palle helped sand as a 12 year old kid back in 1978. Palle has some plans for the car to make it a little more Custom, but nothing on the body will be changed. The car will be lowered, Palle has already found a new Lincoln front axle and had it dropped 2.5 inches. He will also ad a reverse sprint to drop it another inch. The rear will need a little more work since the frame needs to be c-ed to allow the rear axle to drop down to create the perfect ride height. The two part top is worn, and needs to be replaced. The plan right now is to keep the original top as it is and create a new Carson Style Padded Top to replace it. we have created some Photoshopped samples to get a good idea how it is going to look. Palle is still debating on white wall tires or black walls for an earlier, bit more sinister look. The 2.5 inch dropped front axle just came in ready to be installed to lower the front. This is how the car looked shorty after Palle had picked it up in April 2016. Digital Restyling gives the car a proper stance, single bar flipper hubcaps, new white padded top and reshaped side window openings to make it all flow nicer. Same as above, but now with a tan padded top. White padded top, and black wall tires for that early 1940’s look. Same as above, but now with a black padded top… sinister. 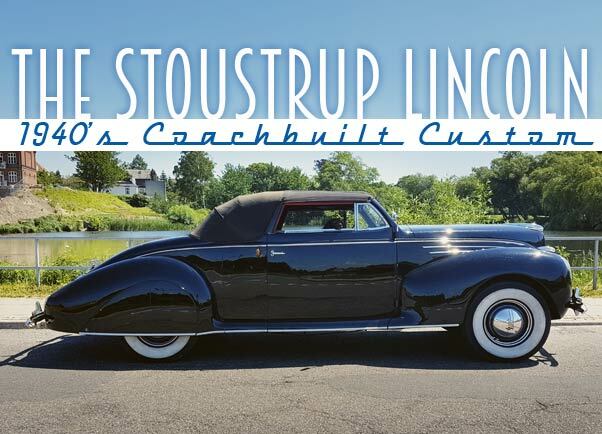 We plan to keep you posted about the progress Palle will make on the Lincoln. When he gets to work on it, hopefully after the summer, we will start a thread on the CCC-Forum to follow the work. Congratulations Palle! What a great story. Congratulations from me as well Palle! What a wonderful story with a true storybook almost-ending. Love what Palle has in store, hope we all can follow along. Drooling all the way. Congratulations mate What an absolutly gourgius car and I´m so excited to see it in person. 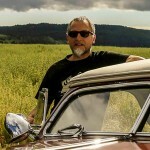 Nice car; excellent article and digital work by Rik. I concur with Zed; white top and white wall tires would be my choice. What a handsome car and incredible conversion! 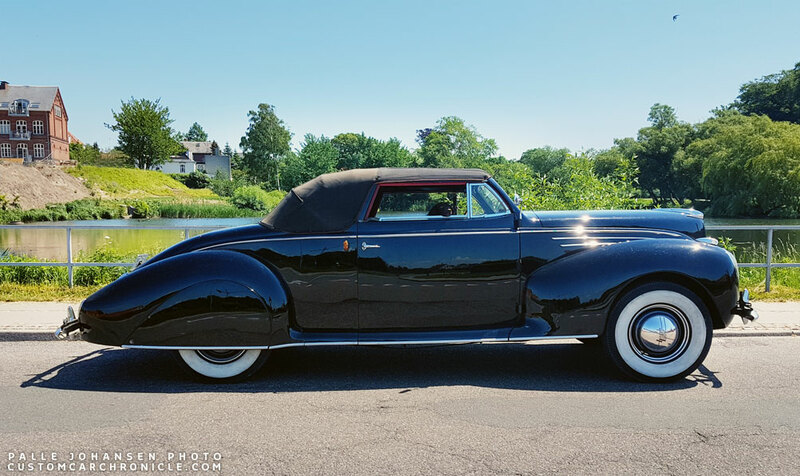 I believe that the coachbuilders’ term for a convertible with a rollback front section is Drophead Sedanca or Sedanca DeVille in Europe and drophead coupe in North America. If a top change is desired, it might be interesting to do a Carson top version with a removable front piece. Perhaps something like the Barris Cadillac Parisienne, but with both front and rear sections removable. That would update it a bit, but preserve the original owner’s intent and favorite design cue. thanks guys…i am excited. we do work hard to have it lowered a bit before taking it to sweden next weekend. i will have to take it by a trailer ,because the engine only has 30 km on it since a complete overhaul..and ive been told to take it easy the first 2-300 km. just if you see some spy photos of me and the car on a trailer..it will be driven hard later haha…Kenneth i have this suggestion that we drink a couple of cold beers in it friday night! !